On this page you’ll find a recipe for smoked seasoned shrimp skewers – the perfect food for summer cookouts. These shrimp skewers are simply irresistible. Other two skewer / kabob recipes are Smoked & Marinated Chicken Skewers and Smoked Sweet and Sour Tofu Skewers. 1. Place the EVOO, garlic, basil, salt, and pepper in a large bowl. Whisk together. Clean the shrimp by removing the shells and taking the intestinal tract out of the back of the shrimp. Add the shrimp to the bowl and toss to coat with the dressing. Set aside while you soak your skewers and prepare your smoker. 2. Remove a rack from the smoker to place the skewers on. Prepare your smoker by adding wood chips to the tray and 1/2 water + 1/2 white wine to the bowl. Preheat the smoker to 225°F. Open the top vent. 3. Place up to 6 shrimp on each skewer by piercing the head end and the tail end. They should look like the letter C lying flat. Place the shrimp skewers on the rack and put the rack inside the smoker. Smoke for 35 minutes, or until the shrimp are just opaque and a pink/white hue. Squeeze some lemon over the shrimp before serving. I like to serve shrimp skewers with other protein based skewers. 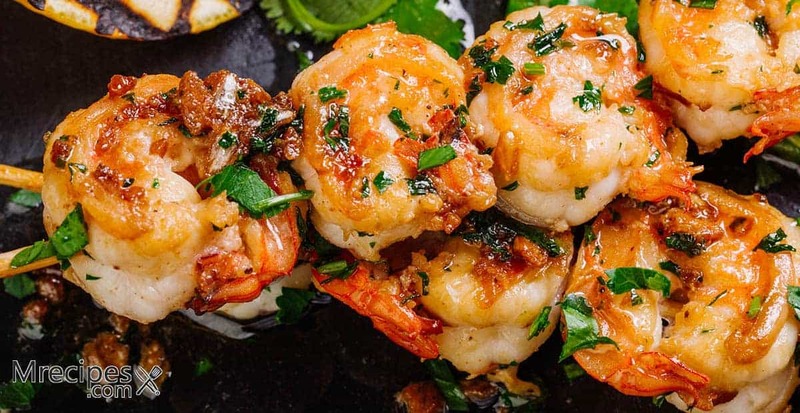 Shrimp is expensive, so it is nice to add other options, such as steak, chicken, or vegetable skewers for a balanced and more affordable spread. Think surf and turf. You might also enjoy our Smoked & Marinated Chicken Skewers and Smoked Sweet and Sour Tofu Skewers recipes.